In addition to some major national artists, some of Seattle’s finest came together at the City Arts Fest, October 18-21, 2012. Being fairly new to the Seattle area, this crash course on the best and brightest of the region’s music scene was an exhilarating breath for a weekend that really showed me what this town has to offer. I checked out three shows that I’ll cover below, featuring some amazing Seattle bands, including my two favorites; My Goodness and Ravenna Woods. Let me get into the shows I checked out and who you all need to investigate moving forward. Friday’s show featured one of my local favorites, Ravenna Woods, in addition to an artist-to-watch, Land of Pines, at the Crocodile in Belltown. Ravenna Woods brings an energy that is second-to-none in Seattle; led by what feels like the Five Hour Energy spokesman, Chris Cunningham. Cunningham’s intense songwriting and lightning-fast finger picking engulfs the stage in hurricane fashion, swirling around every bit of open space, stopping occasionally at the microphone to hit you with intense vocals. The remainder of Ravenna’s four-piece brings a variety of percussion, keys, and vocals backing Cunningham’s fastest-fingers-in-the-west acoustic guitar and lead vocals. Cunningham has a booming voice obviously created for public address, working well with Ravenna’s instrumentation to create a forceful and, at times, haunting air. This vibe combined with timing patterns that can start and stop on a dime result in some of my favorite Ravenna tracks, “Careful Where You Are” and “We Want It All”, getting stuck in my head for days. Check out Ravenna’s Doe Bay session for a fabulous example of the former track. One of Ravenna’s openers, Land of Pines, were the surprise of the evening. Described by KEXP as “Rilo Kiley with razor blades”, LOP come in with amazing emotion and a beautiful one-two male-female vocal punch that will warrant further attention. They are also one of the most random group of tweeters I’ve encountered, often faux quoting famous individuals remarking their love for the band. (“LOP played at my wedding. I cried because their songs have gotten so heavy but yet their lyrics are so tender.” – paula dean” – @landofpines) Saturday featured a pair of music experiences that created plenty of memories. SSG Music hosted a semi-acoustic party at the Crocodile with Cunningham of Ravenna Woods, Daniel Blue of Motopony, Meagan Grandall and Kendra Cox of Lemolo, and Benjamin Verdoes of Mount Saint Helen’s Vietnam Band. The group, dubbed “Organized” by Blue, took turns leading songs of their own and covers of each other’s bands’ tunes, demonstrating a real camaraderie among Seattle artists that was brought to the public’s light by this 4-day event. The highlight of the afternoon was Lemolo’s heart-melting version of Motopony’s “Wait for You,” which was described by Grandall as being “the most romantic song” she’d ever heard. If that’s the most romantic song in existence (which it very well may be), then everyone in the room learned a thing or two about love as Lemolo soothed our souls to a near-silent crowd of consumers soaking in every last one of Blue’s words coming from Grandall’s lips. The mark of a great songwriter is when lyrics can be reinterpreted by different artists in a way that remains impactful, which was proven to be the case thanks to the covers of these artists. Each band’s distinct style shown through in covers, reinforcing the notion that Seattle is a songwriter’s town. Saturday night at Neumo’s was one of the most complete nights of music I’ve ever experienced, headlined by the alt-country masters, The Maldives, and the best band you’ve never heard of, My Goodness. The honky-tonk country act Davidson Hart Kingsbery and the loud, in-your-face Grizzled Mighty set the tone for what the evening had to offer in the stylings of country-meets-garage rock. My Goodness were the highlight of the weekend; loud, dirty, intense, and flawless. This is a band that I had been aware of for a long time, but hadn’t yet had the chance to see. I had almost written them off as another two-piece Black Keys wannabe act, but recognized the strength in their songwriting and melody construction even before everything blew up in a beautiful eruption on Saturday. Joel Schneider (vocals, guitar) has recently been joined by the amazing Andy Lum (drums) to construct the current version of My Goodness. As their set began, the house lights came down and the red lights and smoke emerged. Schneider kicked in some serious clean-yet-dirty licks while Lum gave every drummer in the house a lesson. The combination of Schneider’s straight-from-the-heart combo of lyrics and guitar provides uniqueness with Lum’s “7 or 8 practice” mastery of the band’s drumming catalog (although, it seemed like Lum’s been writing songs with Schneider for years). The Maldives closed out the night with the old west music they know so well. This 7-piece knows how to use each component well; from the guitar licks and harmonies on the left to the greatest banjo-beard combo I’d ever seen on the right. 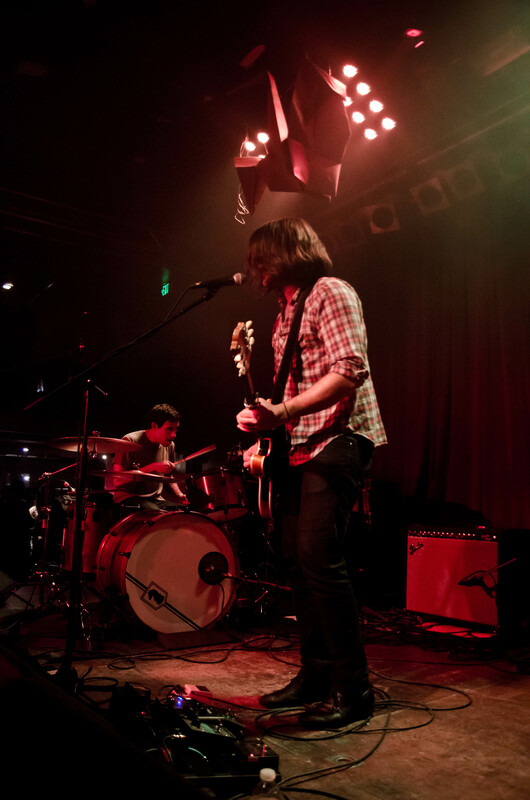 The Maldives have been regarded as “the best unsigned band in Seattle” with good reason. These folks know alt-country and provide some of the cleanest and most heartfelt tunes the genre has to offer. They’ve been a Seattle staple for awhile with good reason. My first City Arts Fest experience was greater than anticipated. The sheer joy I saw on each stage is an obvious result of the Seattle music community being one that is welcoming, supportive, and, above all, incredibly talented. From the energy of Ravenna Woods to the simplicity of Motopony to the sheer volume of My Goodness, the Seattle music scene proved to this third party that the scene is alive, well, and ready for another breakthrough. The only question is which band will do it. In my opinion, they’re all poised to make the leap into the national scene.